Update Dec 20th: All of the videos are now online at the SSI YouTube Channel! Scroll to the bottom of this post for the direct video links. September 20th – 22nd 2016 the Space Studies Institute was proud to present The Breakthrough Propulsion Workshop at Estes Park – three days of cutting edge Science and Engineering in the Rockies. The videos of the presentations are done, and we are proud to announce that we are now releasing them day by day a few at a time and inviting you to view them all in their original order. I will freely admit to our SSI family that as we were packing up the microphones and tripods for the trip to record the Breakthrough Propulsion Workshop I was a tiny bit worried. The physicists and engineers at this gathering are the tops in this niche field and their work is truly at the cutting edge. I thought people who spend their days and nights working out ways to coax radical theories into obtuse mathematics into useful machines might be beyond mere mortal’s comprehension and even somewhat incapable of small talk over breakfast cereal. But after only the first few sessions, the truth was clear: These people are not eccentric Doc Browns in tinfoil hats or evil geniuses out to trick with fluff and flash. They aren’t slick suits with get-rich-quick-selling-quantum-foam promises. They’re professionals. And while they are truly, deeply passionate about their work and they do speak a language that uses Greek symbols as verbs, they, as you’ll see in most of the videos, give pretty clear explanations of their areas of expertise. They know how to make these subjects make sense to each other. And now, to us. I do not mean that the workshop was a high school breeze, but I firmly believe that if you to start at the beginning and put your attention into these presentations the parts that might seem too far ahead by their titles will begin to flow in and the whole will truly add up to a better grasp of these “advanced” topics. To guard against distractions that a conventional conference can potentially allow, the Breakthrough Propulsion Workshop was held in a remote site far from disturbing cellphone signals. We met in a small room where the chairs were all at the same level. The people who are actually doing the hands-on work – those best able to spot the devils in each other’s details – were eyeball to eyeball of each other. There may be some presentations that you don’t think you’ll be interested in, but we hope that you’ll suppress any urge to cherry pick. My own experience proved to me that watching every single presentation ended up giving the very best experience. In fact, there were two sessions that hadn’t seemed to be up my alley that ended up really catching me. It is our hope that no matter what your current level of experience is in these topics, you will come away after watching them with a more complete view of the current state of the art of these real-world technologies. SSI volunteers lugged loads of equipment to Estes Park, Colorado to make sure that this important gathering was documented. It was Gary’s order that we just let the cameras roll and put the viewer into the group as equals, and we believe we have accomplished this goal. 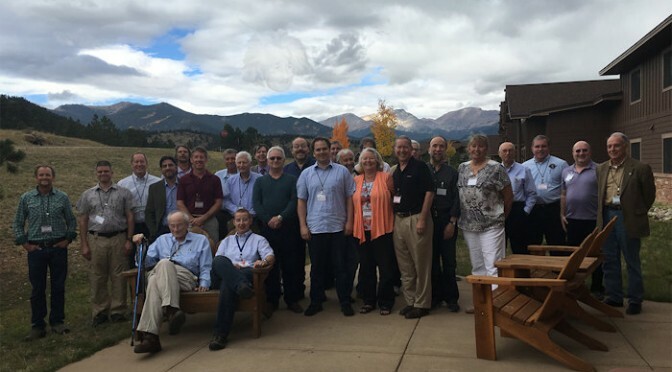 SSI was very proud to be a part of the Breakthrough Propulsion Workshop at Estes Park, September 20th to 22nd, 2016, and we hope that you will make the time in your busy schedule to learn from these dedicated, serious, funny, brilliant and excellent presenters. To view the growing complete list of workshop videos, click here! I prefer to read than watch videos. When will a text version of the proceedings be available? Kindle e-book is preferred. PDF version is second best choice. I am willing to pay for them. Completely understood… YouTube’s closed captioning leaves much to be desired even for non-techspeak. Our part being the video and audio is done and the cleaned, mixed AV is in the hands of the physicists and engineers and I know that they are quite far along on the direct transcriptions. The slides and papers are, the last I heard before the holiday, nearly assembled. They’re working on the print and digital releases and as we hear updates we will pass them right along to you. Please make transcripts available. Please escape/eschew the social network/media paradigm. :). Transcripts are being created by the authors and specialists, Doug. I hear they’re coming along. The timing has nothing to do with any social media use.. I think it’s more related to the holidays getting in the way of tracking down certain specifics for verification. Math symbols and the spoken word for the transcribers can be a little time consuming to get exact. Happy New Year!